Sometimes people want to be able to access their office VPOP3 mail server from a remote site or mobile phone etc. First you need to set your router and/or firewall to allow incoming access to the VPOP3 computer on the relevant ports (eg 110 for POP3, 143 for IMAP4, 5108 for WebMail/CalDAV). This includes if you are using a software firewall, such as the Windows firewall, or other Internet Security software. With the Windows firewall or Internet security software, you may need to 'allow' VPOP3 to act as a service on the Internet and also allow the specific ports through the software firewall as well. By default VPOP3 will refuse access to anyone connecting from outside your local network, so you need to tell VPOP3 to allow access from anywhere. In VPOP3 6.0 or later, go to Services → POP3 (or Services → IMAP4, or Services → Webmail, as appropriate). Then, go to the IP Access Restrictions tab. Press the Add button. Choose Allow and Type: Any Host, then in the Allowed Users box, either leave it unchanged to allow any user to access the VPOP3 service from the Internet, or select one or more VPOP3 usernames to just allow those users to access VPOP3 from the Internet. In VPOP3 3.0 to 5.0, go to Services → POP3 (or Services → IMAP4, or Services → Webmail, as appropriate). Then, go to the IP Access Restrictions tab. Press the Add New Restriction link. Choose Allow and Type: Any Host, then in the Allowed Users box, either leave it blank to allow any user to access the VPOP3 service from the Internet, or enter a list of VPOP3 usernames, separated by spaces, to just allow those users to access VPOP3 from the Internet. 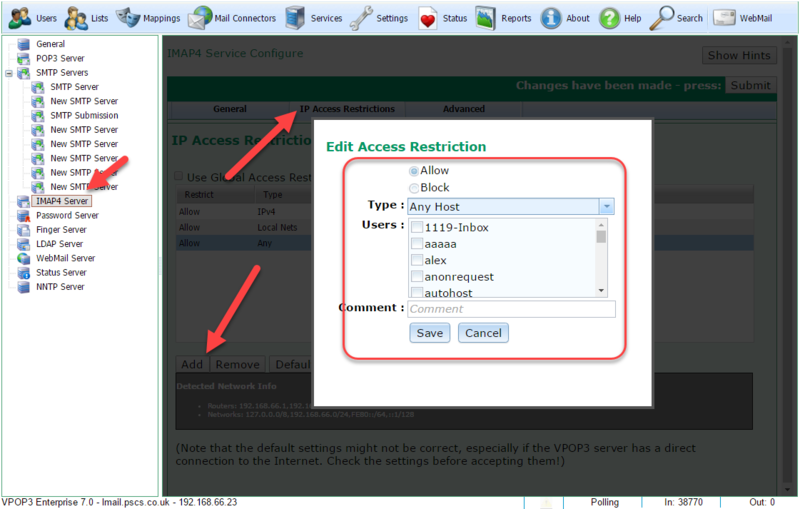 In VPOP3 2.4 to 2.6, go to Services → POP3 (or other service as appropriate), and find the Access Restrictions setting. Press the Add New Restriction link. Choose Type: Any, then in the Allowed Users box, either leave it blank to allow any user to access the VPOP3 service from the Internet, or enter a list of VPOP3 usernames, separated by spaces, to just allow those users to access VPOP3 from the Internet. In earlier versions of VPOP3, go to Services → POP3 (or other service as appropriate), and find the Access Restrictions setting. Add the line 0.0.0.0 0.0.0.0 to the Access Restrictions settings. (This will allow access to anyone with a valid username and password from any IP address - you may want to restrict it to certain users only). Note do NOT simply allow access to anyone to your VPOP3 SMTP service, this will lead to you making VPOP3 into an open relay. Instead you will need to set the SMTP service access restrictions to limit access to your users alone. For the user to access their mail, they connect to the Internet, and use your external Internet IP address assigned by your ISP. If your office has a static IP address on the Internet, then you can simply use that address as the server address in your email client. If you have your own domain, you can make it easier to remember by configuring a DNS name to refer to that IP address. See also: Determining your VPOP3 server address. If you have a static IP address and want computers to be able to work from both inside and outside your network, you MAY be able to use the external IP address in both cases if your router supports NAT loopback, or you may need to set up two DNS servers (or a single DNS server with “zones”). If your office has a dynamic IP address, then you need to use a 'dynamic DNS' service to give your IP address a name which you can use in your email client. If you have any problems with DNS entries (either static or dynamic) then we can help you set them up, but as it is not a VPOP3 problem it will be a chargeable incident.